The Spanish Language can open doors only imagined until now. 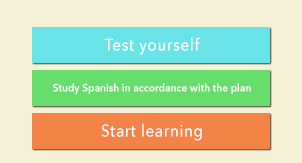 And you can begin acquiring Spanish within the next 10 minutes. Join our dedicated team of Native Spanish Speakers, Highly Qualified Instructors, and Technical Advisors and let us GUIDE YOU EVERY STEP OF THE WAY! Take the first step of your journey right here. Studies have shown that professionals that speak Spanish earn more than professionals who do not speak Spanish. This is a tiny investment in your future. If you desire to learn, laugh, love, travel, work, play, or explore in Spanish - our program is right for you! Let us open the door to the mystery that has been Spanish for too long. Let us help you unravel the apparent complexity of the language and make it simple and easy. Let us do this together. And let us do it now. We Welcome you to The Natural Immersion Technique ®, Cervantes Idiomas.